SR Windows & Glass is capable of custom cutting table top and mirror glass for a variety of applications including dining room tables, display cases and custom bathrooms. Our tempered glass comes in a variety of thicknesses and edge designs to fit most household and office environments. 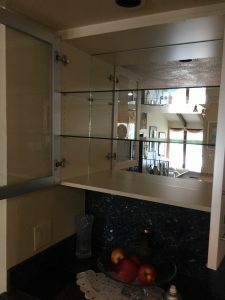 We offer pick-up at our glass shop in Phoenix, however, most customers choose to have their glass and mirrors delivered and installed by one of our professional glaziers. Tempered glass is recommended for table top applications where strength and safety is important. The thickness of the glass is dependent on the size of the table and whether the glass is covering a solid surface or if the glass is providing the structural support (inlay application). The glass edges come in a variety of choices, however, a polished edge is most popular for safety and visual appeal. When ordering table top glass please be sure to specify the exact dimensions and patter of the glass, the preferred glass thickness and the edge design. We offer custom mirrors and mirror installation for bathrooms, households and other commercial applications. We’ve installed mirrors in custom display cases, shelves and as wall coverings in dance studios and gymnasiums. Our glaziers will come to your home or office and measure the dimensions for the mirror. We’ll then fabricate the mirror, deliver it and install it. Given the size of the glass required, we’ll cut flat glass for square and rectangular picture frames. Round or oval picture frame glass must be fabricated on a laser cutting machine and has additional lead time. We can provide any type of glass inserts and shelving including hutch and cabinet door glass inserts. Glass shelves are popular in display cases to give a unique look and emphasis on the contents of the case. Challenge us with your custom glass project today. 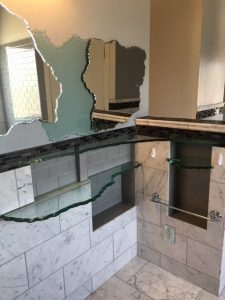 Call or visit SR Windows & Glass in Phoenix, AZ for all your table top glass, custom cut household glass and custom mirrors.